Your perfect client or new customer is on Facebook. We’re pretty certain of it. And we know this because over a Billion people worldwide use Facebook daily. With over 80% of the 18-29 year old demographic (of those online) that daily use count is only going to increase. While Google Adwords has the benefit of providing ads at the time of search (when someone is actively seeking a product or service) Facebook offers a powerful service through focused targeting. Given the amount of information Facebook has access to through user behavior and profiles, they also provide extraordinarily detailed demographic filtering. If you have a clear understanding of your customer, Facebook ad targeting will allow you to filter your ad exposure down to the ‘model’. If you sell wakeboards for example, you know your typical customer (80% of sales?) is a high school or college student, typically male, interested in watersports, boats, skis or snowboards in the winter season, and probably likes one of a few ‘famous’ personalities in the wakeboard world. Each of those things is available to filter your target market to just those who are most likely to engage with your brand. In addition to advertisements running on the Facebook desktop, ads also run on the Facebook network – which includes apps and web services tied to Facebook, and the darling of mobile engagement apps – Instagram. Launch a promotion to attract site visits, invite them to an event, or simply deliver beautiful or exciting images to introduce your brand. 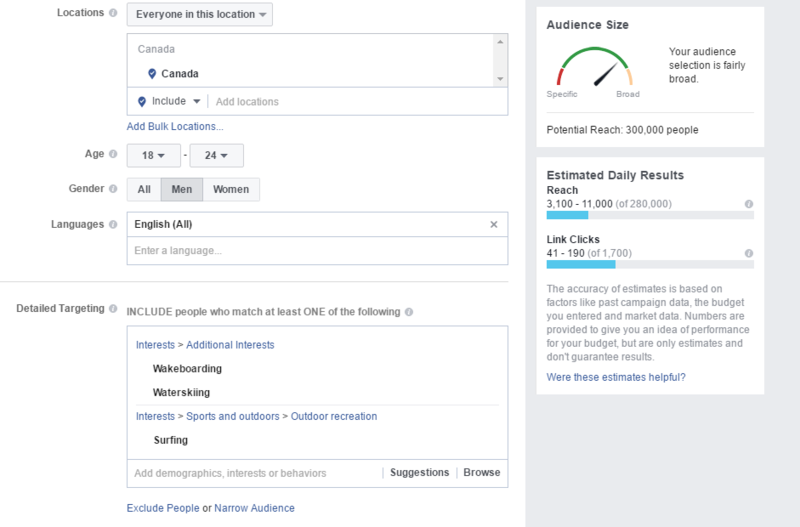 Fine tuning of your audience interests allows you to clearly target potential customers through the Facebook Ad Platform.